"Ireland under Joe Schmidt don't start tournaments well". Discuss. It's certainly true of all of our Six Nations campaigns since RWC2015. Take out Johnny's odds-defying drop goal in Paris and we wouldn't have won any opening encounter from 2016-2019. As far as I'm concerned, this pattern is down to Joe's desire to have his squad together for as long as possible ahead of major tournaments, and with a crucial round 6 of the Champions Cup (as opposed to round 2 ahead of the November window, when we tend to hit the ground running) taking place just two weeks ahead of most Six Nations these days, there's a serious cap on that time. Of course it's the same for everyone but I think Ireland's overall record in recent years is good enough to show that we are more adversely affected. But the only reason I'm drawing attention to this now is because I don't believe we need to worry about it anymore, at least not under Joe. It's not that we tend to start tournaments badly. It's just the Six Nations. We came a cropper at RWC2015 not because of how we played at the beginning, rather how depleted our squad was at the end. By the time RWC2019 comes around, everyone in the Irish squad will have been away from their provinces since the end of May. Joe has them all to himself for a long stretch leading up to our opening pool match, and this brings me nicely to Saturday's opponents who also happen to be the Scots. So the focus of our display in Murrayfield has to be getting back to the kind of gme we know we can play. That performance v England was disappointing, of that there can be no doubt, but it certainly wasn't as catastrophic as some have made out. The fixes are there for us to make, and despite a growing injury list, I believe we can do that with this matchday 23. Robbie Henshaw's late withdrawal before the team announcement was particularly disappointing. I'm sure it would have been very tempting for Joe to give him a second chance at 15 but surely few can dispute that for the rest of this calendar year anyway, if Rob Kearney is fit he should play. 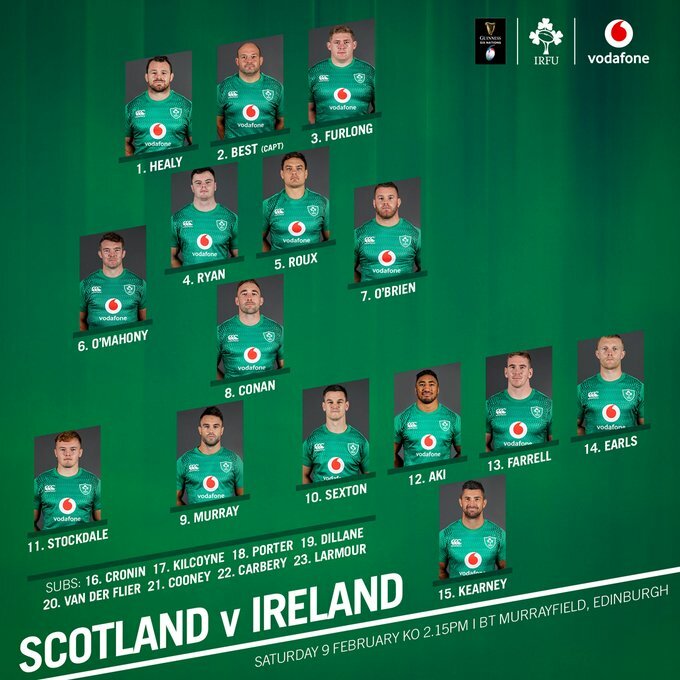 This together with Ringrose being unavailable meant he could have gone to 13, but now we have gone to Chris Farrell, and in a strange way I actually see this as a blessing. If we only think of Saturday's match in terms of the 2019 Six Nations Championship, then we should be going for a bonus point victory to keep us in contention. But that's not how I'm seeing it. After last weekend's considerable knockback, and given the Scots are bound to be fired up for our visit in their second home match in as many weeks, it suits us to aim for a more conservative approach. And it's not like that's a million miles from Joe's wheelhouse either. With Finn Russell, Stuart Hogg and Tommy Seymour at their disposal, anything remotely resembling broken play will be like red meat to Gregor Townsend's men so we have every incentive to bore them into stagnation and make our own scoring chances in the way we do best as opposed to forcing it. For this reason I think the Aki/Farrell midfield axis can be very effective, and with his clever squad use in November, Joe has tangible proof that this is the case. I have a feeling that a lot of Irish fans might be complaining about our approach in the opening half hour or so, but once it foils the home side I won't be one of them. Another who didn't deserve to be left out is Josh van der Flier, but I can totally appreciate why Joe would want to elevate Sean O’Brien (just confirmed to be London Irish bound after the World Cup, best of luck to him) on account of the leadership he brings with him. We all know he wouldn't have that starting jersey if he wasn't 100% ready and I can't wait to see him and Peter O’Mahony getting stuck into what should be a physical back row battle. And what an opportunity for Quinn Roux. I reckon his remit is to get stuck in to the physical side of the game and attach himself to James Ryan's carries to increase their power exponentially. He can also be an effective option at both lineout and scrum. It seems I keep going deep into Ireland previews without so much as mentioning our world class half backs! Both were below their own high standards last week and no doubt will be determined to reverse that in Edinburgh, but once more it needs to be measured. Weather permitting I see a lot of Murray box kicks in our immediate future. Our bench has plenty of beef for the forwards and plenty of flair for the backs - you can't ask for a whole lot more than that. With all of the above in mind I think we can actually better the bookies’ spread of 6 points and actually deny the home side a losing bonus, if only just. What of the ref? I'm not Romain Poite's biggest critic by a long stretch but that said, every issue I had with Garcès last weekend has been known to be in his fellow countryman's playbook as well, so it will be essential that Rory Best establishes a rapport with him quickly when things don't look right. Substitutes 16. Fraser Brown 17. Jamie Bhatti 18. D’arcy Rae 19. Ben Toolis 20. Rob Harley 21. Ali Price 22. Pete Horne 23. Blair Kinghorn.